I love old buildings. In fact, a few years ago, when I was looking for a house in the DC area, I much preferred something extremely old and more fixer than upper. My husband didn’t exactly share the same desire, and we compromised. But my love of architecture and old buildings remains intact. 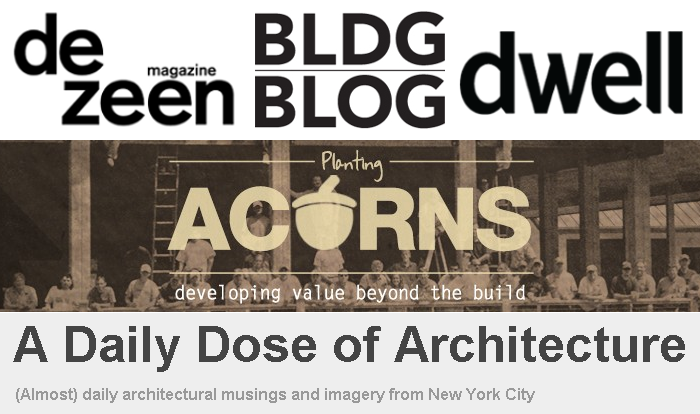 So, I decided it was time to look at some quality blogs on the building, architecture, and design front. BLDGBLOG provides an intriguing look at architecture, landscape, and urban speculation. It’s written by Geoff Manaugh. BLDGBLOG caught my eye for several reasons. First, it’s a very attractive site filled with art, photography, and renderings. Second, the writing is really accessible. Finally, the content is just fascinating. Other posts I enjoyed include Monumental, which is a short post on a painting by Erastus Salisbury Field called Historical Monument of the American Republic, and The Neurological Side-Effects of 3D. According to the site, it was launched Nov. 2006 and since has rapidly grown, attracting more than 1.75 million unique visitors a month. The site covers a ton of ground, including interiors, design, technology, and news. It also features jobs. Some of the posts that I found interesting include 3XN reveals “dynamic, undulating” design for Swiss Olympic headquarters, Hiroyuki Ito completes Tokyo housing block with staggered concrete silhouette, and timber disks speckle the concave facades of Studio Gang’s Michigan college building. A Daily Dose of Architecture provides “(almost) daily architectural musings and imagery from New York City.” It’s written and managed by architect and blogger John Hill. It’s hard not to get caught up in the photos Hill takes for his posts. They’re pretty awesome; he’s got a great eye. One of my favorite posts was Cooper Hewitt Unveiled, which covered the press preview of the unveiling of the Cooper Hewitt Smithsonian Design Museum’s three-year reno. The museum opened to the public on Dec. 12. Other posts I enjoyed include A Year in Architecture 2014 and The Next Glass Walkway? Dwell happens to be one of my favorite magazines. My best friend – an industrial designer – introduced me to this awesome piece of journalism and design. Narrowing down some noteworthy posts to just a few was nearly impossible. Some posts that caught my attention were Adventurous Apartment Building Made of 36 Shipping Containers, Fantastic Desks Complete These Inviting Home Offices, and A Modern House in Rural Spain. The site is a product of Stewart Perry, which provides commercial construction services in the southeast, southwest, and mid-Atlantic states. On the site, company founder Merrill Stewart talks about how “people are so much more than their jobs.” Stewart uses the analogy of planting acorns. Some of the posts that caught my eye on Planting Acorns include Vertical Expansion in an Existing Building and Trading Cars for a Bike. P.S. Ever wonder how we come up with ideas for our blog profiles? Our handy list of industries and subjects on PR Newswire for Journalists stays top of mind. If you’re a blogger or journalist looking for building, construction, or design news, let us know. We’re happy to customize that feed for you on PR Newswire for Journalists. Awesome list! I appreciate your efforts for the list you have shared. Keep sharing and helping people get to know about the latest in the construction industry.